Retailers in India have always used the IT city of Bengaluru as their test bed. 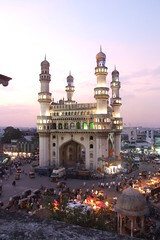 They are mow moving to woo consumers in Hyderabad, yet another IT destination. We are currently positive on the market opportunity for such stores in India and our plan is to establish about 100 stores by 2010, of them 50 would be through franchisee route. We will provide all the merchandise and help partners setup stores. Each large Max retail store entails an investment of Rs 4 crore of which Rs 2 crore is for the merchandise and the rest for infrastructure. Max will open 4 more stores in Hyderabad and one each in Vizag and Vijaywada. Croma Electronics – JV between Tata and Woolworth which tasted the success of Electronics retailing in Karnataka, Maharashtra, Gujarat and Delhi NCR is all set to expand its footprint to Hyderabad. Croma has 23 stores operational wants to setup atleast 40 and cover the important South Indian cities. Croma Electronics sell 70% of elctronics goods while 30% is white goods such as washing machine, dish washers etc. The Croma Electronics store in Juhu has been consistently doing well and has baten its counterparts in Australia, the home country of Woolworth.